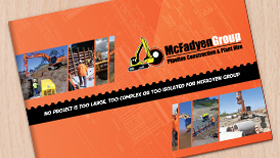 McFadyen Group - McFadyen Group (MFG) is a leading civil works company specialising in Pipeline Construction, Plant & Excavator Hire in Australia. McFadyen Group (MFG) is a leader in the plant hire and all aspects of pipeline construction industry including sewer, stormwater and water mains. MFG continually grows its business to meet ever expanding Client needs. Located near Brisbane, McFadyen Group (MFG) is a privately owned civil works contracting company, providing large businesses and government departments with quality Plant (including excavators) for Plant Hire and Pipeline Construction services at excellent rates. MFG is a leader in the Plant Hire and Pipeline Construction industry and continually grows its business to meet ever-expanding Client needs. MFG’s Plant and Equipment has been used on more than 25 of the country’s largest projects. In Queensland this includes Brisbane’s Airport Link and the Gold Coast Rapid Transit Project (Gold Coast Light Rail), while in New South Wales MFG have been involved in the Pacific Complete Project from Ballina to Woolgoolga and the CMC Pacific Highway Upgrade Project; plus other major projects across the country. MFG is proud to offer competitive Excavator Hire prices and deals on other services without sacrificing quality. MFG undertake regular measures to ensure all equipment and contractors are of an exemplary standard. Clients receive quality Plant and Equipment that is regularly serviced by qualified Fitters and Operators who frequently undergo training to uphold MFG’s reputation as one of Australia’s most experienced and reliable Pipeline Construction business. 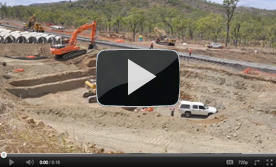 Additionally, MFG’s owner and key staff each have many years’ experience in the civil contracting industry at Pipeline Construction projects of all scales and at various locations throughout Australia. This is reflected in the industry knowledge and expert advice provided at all MFG projects. For any enquiry regarding MFG's Plant Hire (including hiring and excavator) or Pipeline Construction services, please contact MFG today.